People ask us that a lot. Prospective farmers ask us. Market customers ask us. Friends and family ask us. Our winter work looks very different than our spring or summer or fall work but it’s equally as important to the success of our farm. Our answer: There are many things we do in the winter. On a very basic level, we keep our house from freezing. Our house is heated only with our wood stove. A few years ago, we had insulation installed into our old farmhouse which has helped a lot. We don’t heat the second floor of our house, where our bedroom is located, instead just relying on mountains of wool blankets from thrift stores. But heating the house still takes vigilance and we don’t leave the house for too long in cold weather because of it. If anyone is remotely interested in hanging out with us on cold days, it’s highly likely that much of that time will be spent in front of our wood stove. Shovelling snow is of course something we do (in solidarity with all other Canadians). But, it’s not just our driveway. The snow from the top and sides of the tunnels must be kept clear so the tunnels don’t collapse in on themselves. This means that when the forecast calls for snow, we can’t be too far from the farm. We process all the things we’ve dried. 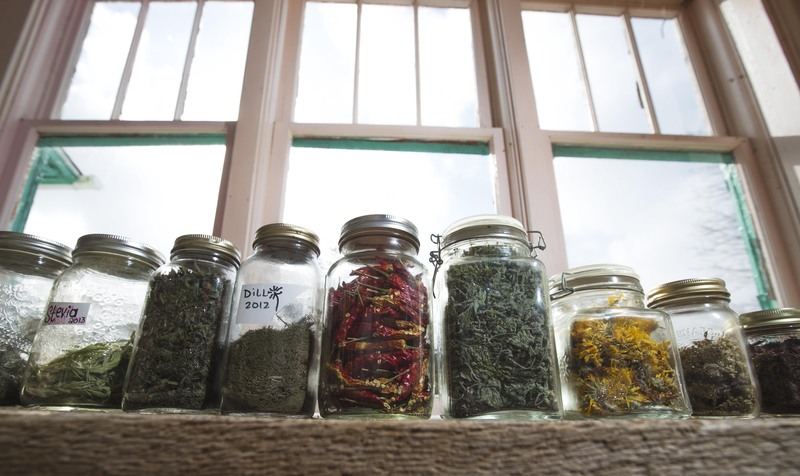 Culinary herbs, medicinal herbs, flowers, and seeds that have been dried and then stored in their rougher state (on the stem or in the seed pod) get threshed or ground or, in the case of the flowers, stuck in vases around the house. 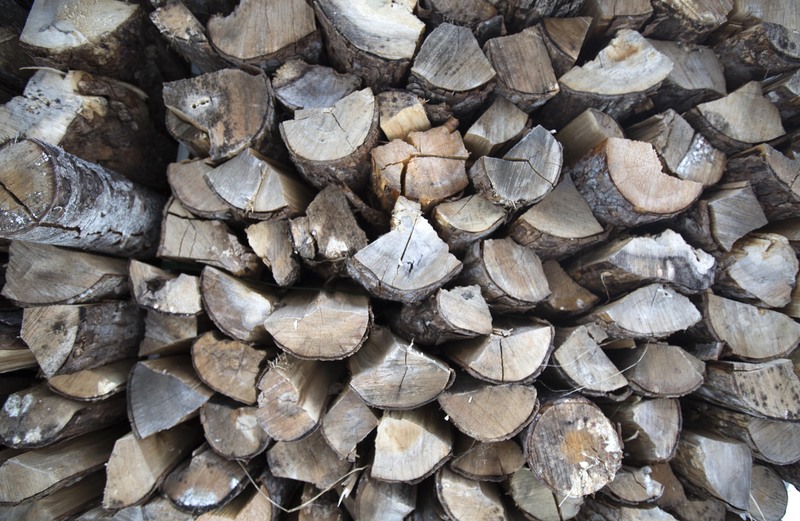 A large portion of our winter diet comes from food we’ve frozen, stored, dried, and fermented and there’s almost always a pot of food cooking (or at least water to warm) on our wood stove. We try our best to improve our winter growing/overwintering systems. We definitely don’t have this down on our farm yet and every year have failures and (small) successes. But we keep trying and are still very keen. 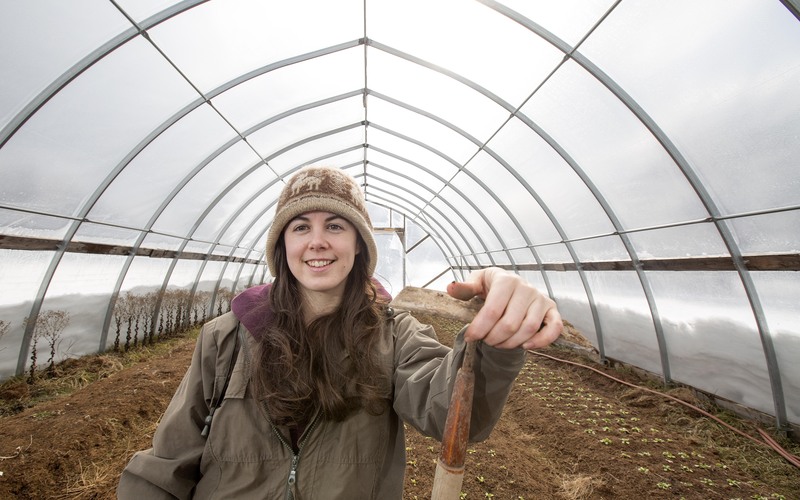 Before we started Broadfork Farm, Shannon interned with Paul and Sandy Arnold at Pleasant Valley Farm in Argyle, NY to learn about (among many things) winter hoophouse growing. Their knowledge, experience, and innovation continue to inspire us and we hope to one day be even half as good at winter growing as they are. But until then, we muddle our way through winter growing as best we can. The largest chunk of our time in the winter is spent planning for the coming season (and longer….5-year, 10 year, and 20 year timelines are re-visited and re-adjusted). and then Seed Orders take up a lot of time. The Budget, Cash Flow, and the rest of the bookeeping and accounting are all done. Researching equipment and tool purchases, infrastructure developments, new crops, or old crops/new techniques…. Soil/land/field/building/market stand improvements and projects…..
Professional development is a big priority for us in the winter. Getting together with other farmers, attending farming conferences and workshops, reading books and magazines and research papers, listening to farming podcasts, and attending webinars are all very valuable for us and we place a high value on them. We also revisit our business plan, make any changes or make sure we’re on track.We Forecast and Backcast. We learn more about business management in general and figure out how we can improve as small business owners/entrepreneurs. This includes trying to improve our website. The winter is also when people sign up for our Market Food Club and we meet with store managers and chefs to plan the coming season with them (see the To Your Plate page for an idea of who these folks are). We also spend time recuperating from the work of the season. Whether that’s deliciously sleeping in or spending too long cuddling a purring cat or watching “hen TV” or movies we borrow from our local library, the winter feels luxurious compared to the growing season. Our to-do list is just as long but there are less time-sensitive/urgent jobs on it. Most of the deadlines for tasks are just…To-Do in Winter. And what does January hold? Clean account books. Bare diaries. Three hundred and sixty-five new days, neatly parceled into weeks, months, seasons. A chunk of time, of life, waiting to be filled. One thing is certain. There will be more newness than ever before. All the world over men and women are facing changed values, an altered lay-out of life. Photo Credit: All of the pictures in this blog post were taken by Len Wagg for a project by ThinkFarm through Communications Nova Scotia. Thanks for sharing! I hope you guys have a great winter! Very informative post especially the winter hoophouse growing. My in laws, who live in New Hampshire, mostly use a wood stove for heat all day in the winter and the heat at night.